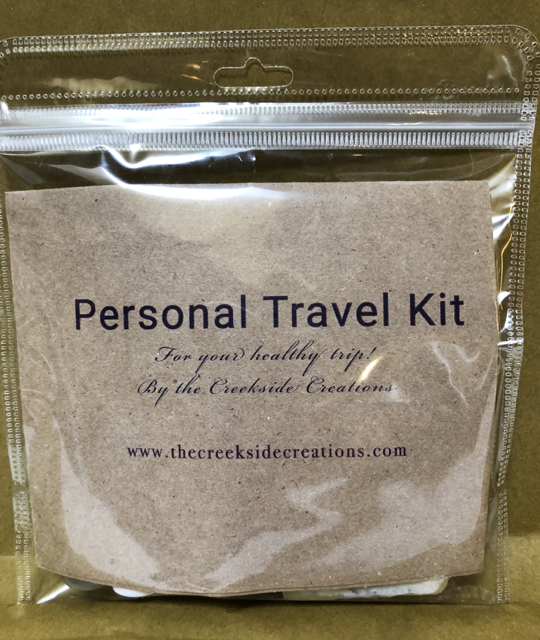 All Natural Personal Travel Kits! TSA Friendly! Going on a trip? Taking a vacation? Lucky you! Want to do it easily with just your carry-on? Then you’ll need to think "TSA Friendly" sizes for your personal needs! A 1 - 2 week supply of our all-natural soap, lotion, lip balm, and breath spray, packed in a convenient and see-through zip bag. All items are sized to be perfect to pass the TSA requirements! Handcrafted Soap: Our natural soaps are produced the cold-process way; this natural saponification process takes six - eight weeks for each bar to cure completely. We include the purest essential oils, specific organic nutrients from the flowers,seeds, roots and stems of botanicals, the finest quality organic carrier oils such as coconut, apricot kernel, avocado, hazelnut, and many others, and organic therapeutic essential oils to moisturize, condition, stimulate, exfoliate or in other ways benefit the skin. As far as coloring, we gently grind or infuse nutritional hand-grown organic herbs and marble them into the soaps, reducing any possible health risks that can occur from brightly colored synthetic ingredients! Organic Body Lotion: Every ingredient has been carefully researched and formulated to offer a deeply rich and luxurious lotion! Our organic lotions contains organic artisan- distilled hydrosols and natural plant oils and butters, blended together to offer intensive healing for your skin: Apricot Kernel Oil softens, moisturizes and nourishes. Evening Primrose Oil moisturizes, soothes, regenerates and rejuvenates. Olive Oil softens, soothes, cleanses, moisturizes, conditions, restores and nourishes. Jojoba Oil softens, soothes, nourishes, moisturizes, and protects. Aloe Vera soothes, softens, moisturizes, hydrates and renews. Shea Butter is one of the best butter for skin care; it moisturizes, smoothes, hydrates and softens. Witch Hazel Hydrosol reduces redness, rashes, itching, scaling of skin, and combats eczema and psoriasis; it is very healing and anti-aging. Comfrey Hydrosol is also anti-Aging; it stimulates and strengthens tissues, heals and conditions. Green Tea Hydrosol aids in anti-aging, wrinkle reduction, and reduces sun damage. Vegetable Glycerin softens and soothes, and helps to retain moisture. ROE (rosemary antioxidant extract) is an organic antioxidant and preservative, very beneficial to the skin. Ethically Harvested Beeswax is both healing and emollient. E-Wax is a vegetable-based organic emulsifier. Organic Lip Balm: This is a rich, organic, petroleum free balm for your lips! No synthetic chemicals! Both shea and cocoa butters are natural sun protective oils, and they protect the tender skin from the effects of sun, wind and dry air. Blended with ethically harvested beeswax and pure essential oils. Organic Breath Freshener: A natural way to assure that your breath is at its best when you shake hands or kiss! Made with organic ingredients, including artisan-distilled peppermint hydrosol, essential oils of rosemary, peppermint and orange, sea salt and organic xylitol. Small enough to carry in your pocket! A few spritzes instead of a chemical-laden breath mint will do the trick! 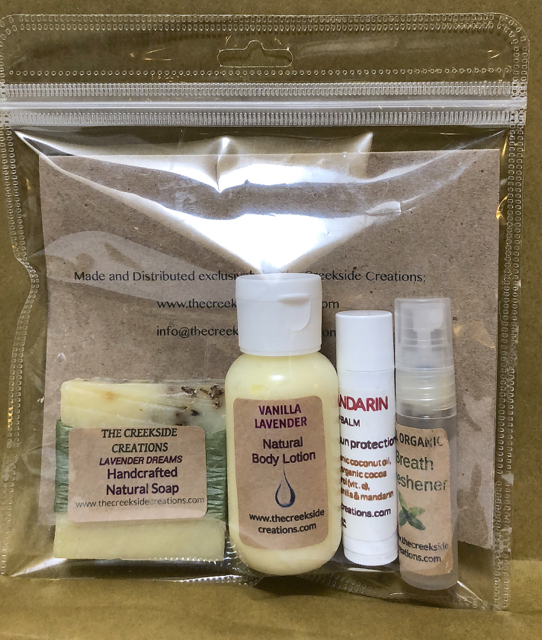 All FOUR products in this handy Travel Kit are Organic, Nutritious, Lovely, and made by The Creekside Creations! Click the button below to add the Personal Travel Kit to your wish list.